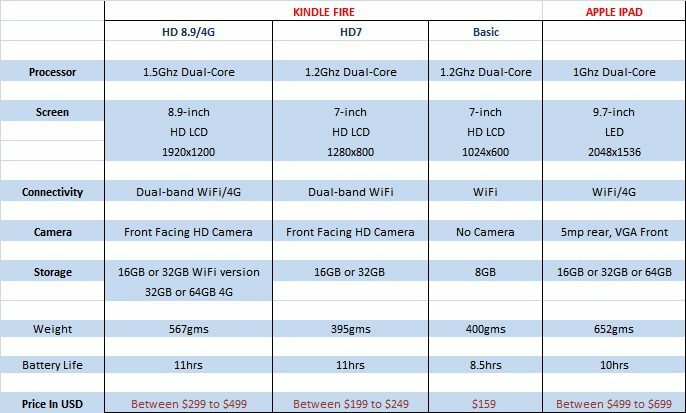 As soon as rumors of the new Kindle Fire started making the rounds, we began speculating about the specs and pricing that Amazon would opt for. After a very hyped reveal this week, the brand new Kindle Fire HD has taken direct aim at it’s primary competitor and market leader in the form of Apple’s iPad. So to put the competition in perspective here is the breakdown of the two tablets. From the comparison (below) it seems that the new Kindle Fire HD is quite a competitive tablet, but the iPad has a bigger screen and a better resolution to offer. While the Kindle previously remained a WiFi only device, this has been upgraded in the high end Kindle Fire HD which is now available with 4G. From the comparison it seems that the new Kindle Fire HD is quite a competitive tablet, but the iPad has a bigger screen and a better resolution to offer. While the Kindle previously remained a WiFi only device, this has been upgraded in the high end Kindle Fire HD which is now available with 4G. The difference that sets the Kindle Fire apart is the pricing. The Fire is modestly priced when compared to the iPad, thus it aims to target the sector of audience who desire the features of a tablet but are weary of the price of the iPad. The iPad’s 16GB version(basic, WiFi only) is priced around $499, which is the same price that a customer can purchase a 32GB Kindle Fire HD with 4G cellular network. While the iPad has the support of the expansive app store, the Kindle Fire is more focused on books and movies, thus the two tablets differ on the choice of activities that they tend more to focus on. But since the Kindle Fire only supports the Amazon apps it cuts down on the number of apps available to the consumer even though the Fire runs on a modified android operating system. Looking at it overall, the iPad is slightly ahead of the Kindle Fire, but for it’s pricing the Fire is a very competitive tablet currently in the market. 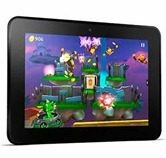 The Kindle Fire will appeal to shoppers who are looking for the comfort of a solid tablet with great features, but are not willing to shell out the price of an iPad. Share with us your views about these two tablets. If you want to buy one, which will it be? Leave your comments below.